Yves here. I know craazyman, and presumably other male readers, will enjoy learning about this sartorial indicator. Plus we need a break from Trump. As if it weren’t already certain, President Vladimir Putin intends to run again for president in 2018. He has made this visibly obvious (lead image), though it’s not yet officially so. The signal Putin has chosen – a unique one in the history of European and American leaders of state — is one which kings display on their chests. That’s peaked lapels instead of notched lapels on their suit jackets. 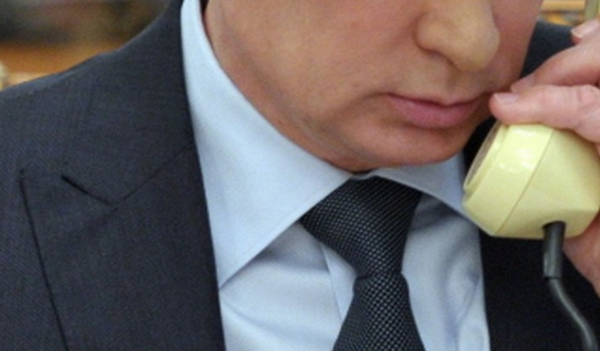 Until Putin, the last president in Moscow to wear peaked lapels was Mikhail Gorbachev. By the time he did that in August 1991, he had just five months left in power. Lapels are to men’s coats as foreskins are to penises. They lost their function long ago. These days, lapels are a leftover, a fashionable decoration to some, a fetish to others. In the evolution of men’s coats in the European climate, rows of buttons ran all the way up the jacket to allow it to close with a collar at the neck. Military uniforms always buttoned under the chin. With climate warming; closed vehicles for travelling; interior heating in houses; and empires with tropical spots, it became customary to fold jacket collars open at the neck, then open them all the way down to the waist. This opening created jacket flaps, aka lapels. Removing the buttons, notches and froggings to fasten them eliminated the old function, leaving behind a fashion. In tailoring terms, as modelled by Russia’s last tsar Nicholas II, the lapel started with a decorative flap (below, left); then cut to a notch (centre), or to a peak (right). Regime change doesn’t mean lapel change. The more men who have replaced the Russian monarchy, and the less militarized their rule, the more variety in their lapels. Left, Josef Stalin wore notched lapels; Vladimir Lenin with shawl lapels; Mikhail Kalinin in peaked lapels. Senior Kremlin leaders have always had the services of the Kremlin tailor. The latest in that line to talk, an Indian who made suits for then President Dmitry Medvedev in 2010, was ordered by the security services to keep silence. A spokesman for Putin’s press service said today there is no information on where his suits come from. Tailors come and go, but the fashion in lapels has not. Since 1991, notched lapels have been the uniform for the business day. For tailors, cutting peaked lapels requires exceptional skill. The result – curvature of the lapel, stitching at the lapel edges, and the design of the peaks – is invariably more distinctive than notching. 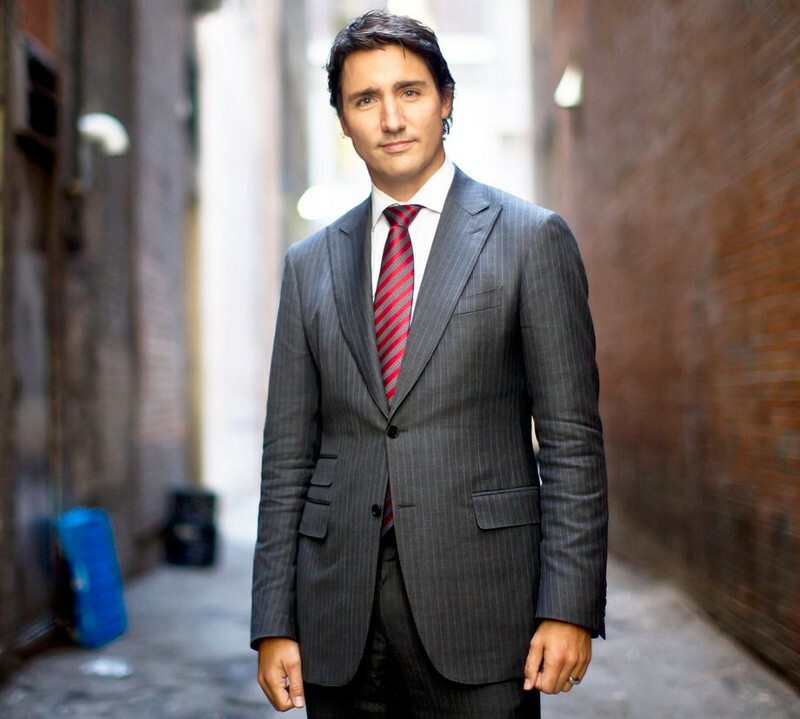 In this way, peaked lapels are the cut of politicians who are secure in their power, and confident of keeping it. The peaked lapel cut makes a politician stand out from his colleagues, rivals, opponents. The members of the Soviet Politburo didn’t wear them; Lenin did; Stalin could, though he preferred military jackets. Nikita Khrushchev, Leonid Brezhnev, Yury Andropov, and Konstantin Chernenko were never seen in peaked lapels. When Boris Yeltsin was on the rise, he wore notched lapels. As he deteriorated in mind, as well as in power, his lapels did too. Here (below, left) the over-confident Mikhail Gorbachev (peak lapels) in August 1991, still President of the Soviet Union, was meeting Yelstin (notches), then President of Russia. And here, below right, is Yeltsin announcing his exit on December 31, 1999, his notches slipping almost into shawls. In the modern history of men’s costumes, no source of cutting skill and design has lasted as long as Savile Row, the street of bespoke tailors in London since 1850, when the tailors succeeded the doctors because the owners of the mansions in Mayfair began to live longer and could afford to worry more about the cut of their cloth than of their liver. Bespoke, or made to measure suits must always be more expensive than machine-made garments. But British politicians who aim to get elected don’t want to appear to have paid too much on Savile Row; that’s because they don’t want voters to suspect them of stealing the money and lavishing it on their vanity. The greatest lapel cutter in Savile Row history was Tommy Nutter (below, left), who practised on the street between 1969 and 1976. Pop singers (right) wore his suits; politicians didn’t dare. Prime Minister Tony Blair never wore peaked lapels except in evening suits, and claimed he bought his business suits from an Armani rack in Italy. Gordon Browne, the Labour Party Chancellor of the Exchequer under Blair from 1997 to 2007, then Blair’s successor as prime minister, 2007-2010, bought and wore Savile Row tailoring. So did David Cameron, the Conservative Party Prime Minister between 2010 and 2016, Likewise, they paid a lot for their Savile Row suits, but they concealed it by notching their lapels. In his formal evening dress Cameron wore shawl lapels (left) more often than peaked lapels (right). The only British politician to wear peaked lapels regularly in public is the king in waiting, Prince Charles. In continental Europe it’s the same. Politicians elected by the people wear notched or shawl lapels; politicians elected by God or divine right wear peaked lapels. In addition to Price Charles (below, left), that in includes King Carl Gustaf XVI of Sweden (centre), and King Felipe VI of Spain. In the US Presidents Franklin Roosevelt, Harry Truman and Dwight Eisenhower wore peaked lapels from time to time. Lyndon Johnson, Richard Nixon, the two Bushes, Bill Clinton, and Barack Obama never – except for evening costume. Kings serve for life; prime ministers, chancellors and presidents for one or two terms, or if they are lucky, three or four. Peaked lapels mean the wearer thinks he is in for life. There is only one exception to the rule that fixed-term or short-run political leaders in Europe and America always wear notched lapels. 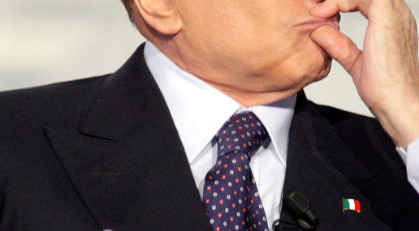 There was one prime minister to wear peaked labels through four terms and nine years, a record in Italy; that was Silvio Berlusconi. This entry was posted in Curiousities, Guest Post, Politics on February 10, 2017 by Yves Smith. I don’t have a jacket, or a suit. Sometimes funerals are an issue. I know someone who had the same problem, he went to his fathers funeral in the only black top he had, his Manchester United away strip jersey. Given that his father was an Arsenal fan, it was considered not in the best taste….. I thought black for funerals was an anachronism. Over fifty years ago, I remember the daughters of a man who had had a hard, hard death from cancer appearing at his autumn funeral, one in bright yellow, the other in bright orange, celebrating his release. I wouldn’t do that if I were not near kin or sure of their feelings in the matter, but I have never worn black to a funeral. It is amazing how many social conventions hang on against all reason, and in some matters of dress it seems men are much more constrained than women. In a way that’s an advantage: pick up a tie and a suit that fits at Goodwill and you have the rudiments of the uniform. But it’s a strange custom. Suits as we know them come out of a more egalitarian era. The Versailles crowd dressed in all kinds of styles. Men’s styles were extravagant as courtiers jockeyed for position. This was common among the upper classes. The Pope’s dress collection wasn’t Papal state specific. Browse photos of plantation owners. Katherine.. Maybe when our society had more cultural bounds and less spoken personal words, to dress in black to signal that grief had come was helpful . someplace else wherever it has taken them where normal routine is interrupted. As Katharine remarks above, Goodwill is your friend here. Especially, try shopping at a Goodwill close to a wealthy neighborhood. Hang on a minute, Mr. Helmer. Pardon my digression, but foreskins have most decidedly not lost their function. My husband swears by his to provide the nuanced sensation that many American men will never know, and I concur for an entirely different but just as supportive reason. Just as the appendix was once regarded as a vestigial organ, and is now recognized to play a crucial role in healthy immune function, the foreskin is now regarded by science as an essential part of the male anatomy, providing immunological defense, physical protection for the glans, and delightful innervation. I pity the mutilated, most of whom had no say in the matter. As soon a I read that paragraph I knew it would trigger someone ahahaha. More and more medical professionals refuse to circumcise infants. There are studies that show no difference in sensation but how would I know as someone with the wrong biological parts etc. It’s been shown helpful in preventing HIV where that’s prevalent but that’s a decision an adult can make for him or herself. Something about an object in surgery above the patients view….. The peaked lapel gap is a national security threat and a personal disgrace. Also, tons of ink have been spilled about the horrors of vaginal mutilation but one hardly ever hears about the horrors of penile mutilation. Just another example of the pervasive sexism in the US. Or of the power of the mohel lobby over MSM and the AMA. I am not sure which, and having just now realized the glaring absence of peaked lapel suits in my closet I am too distraught to investigate the matter further. 3 am, cant sleep, possessing neither peaked, notched nor fore. Great read to start day. Lets hope no one reads this to Mr T! Or maybe they should! Tweets about peaks and notches would be a welcome comic relief! Frankly, Pres. Putin’s leadership has been a joy to see; along with his venerable diplomat Lavrov. I read somewhere that Gorbachev regards Putin’s reign as a necessary phase to a better age for Russia. Presumably this would be the democratic socialist one that Gorbachev himself wanted to put in place until the US helped to mess everything up. I hope so. The great flaw with the USSR was the age of every functionary was basically the same, and they retired in 1990 or so. The result was a government with no government. Yeltsin and his gang sold everything that wasn’t nailed down. Gorbachev sees a country that needs a steady era after Yeltsin and Western looting but one that isn’t too ideologically driven and relatively conservative in its approach. Putin might want to conduct a mass purge, but he knows he can’t fire all the people in one sector without having the problem of everyone being the same age. Just so long as you are not a journalist that offers critical analysis. These sure look like peaked lapels to me. Sigh. yup…and in royal purple no less. A lot depends on how the photographer set the white balance. Also, the material was quite reflective, which introduces some issues into the analysis. 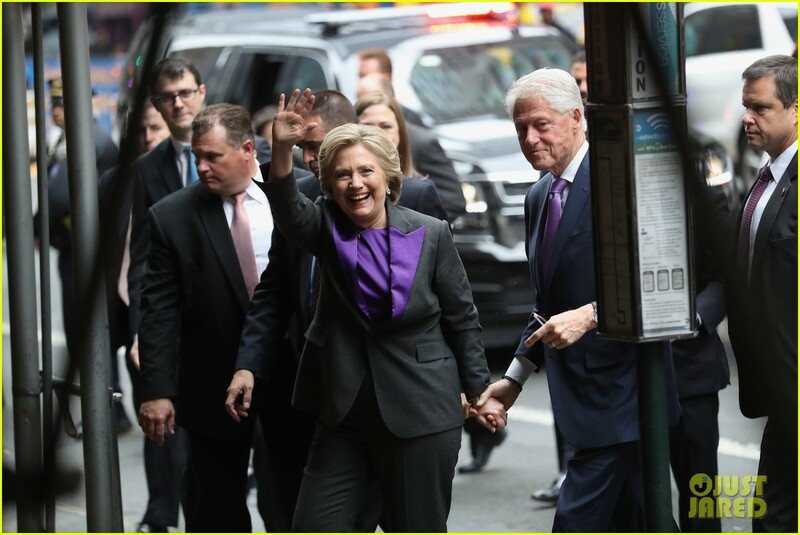 That said, I found a pic of Clinton walking down the street after her concession speech, which imo would have the best chance of having the correct white balance due to the pic being taken in natural light, and from a brief analysis of the RGB values I would say the color is indeed royal purple. We have a Hunter color analyzer –in our case under-utilized just as a QC device to measure whiteness. Before we got it, i never appreciated how many shades of white the human eye can perceive. But whenever i need to match the odd paint color, it analyses to a bulletproof characterization. Because color is dependent on light, it’s hard to get a “true” color reading in a case like this. There are too many variables, starting with the camera that shot the photo and where the photographer was in the room. The additional variable here making it extremely difficult is that satin is a shiny fabric, so folds and wrinkles reflect light differently. You can place the eye-dropper in twenty different spots and get 20 different readings. I have a version of that photo saved in my files. It’s her Third Way signal. The photo I have is more brightly lit, but I did some additional color and light correction so that the red on the flag in the background was truer to the red of the American flag, without turning Hillary into a lobster. I took about ten samples, and the two closest matches are #512578 and #542a7b. These are very blue purples, but “royal purple” does have more blue than red, as the Wikipedia entry notes. Color may be a one of the best examples of subjective truth, as it depends on our perspective and how “enlightened” an environment we’re in. 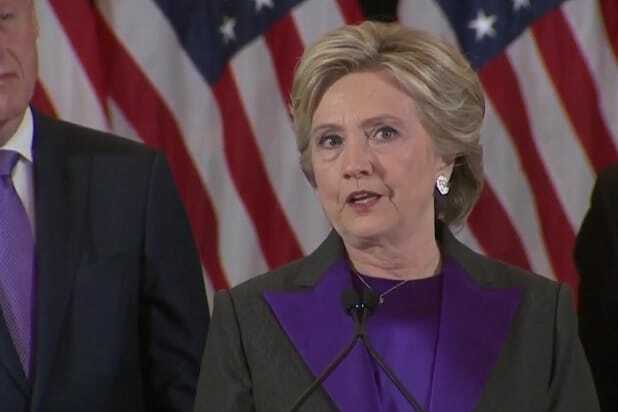 Team Hillary obviously didn’t see the right shade of purple. #711a57 would have been more like it. Bill’s appear to be peaked also. The plot thickens. Pray what is the difference between a President for life ( Putin ; Russia) and the neo-liberal Class being the ruler for life ( in the West)? An individual eventually dies; the Neo liberal class with its Krugmans dont. Let us cut this Trump and Putin bashing…..The present is as disgusting as the past always was. Suits and shirts change with the seasons. Flared pants come and go. 1990s – remember there were four, five buttons? 1970s two?? Checked my small collection of suits (only need them occasionally now) – no notched lapels. Feeling a little insecure now. My memory of them is that they are an old style, more often seen in the double breasted, which will make a comeback. Love the diversity of subjects here. Saturday is always better with NC to deliver me the real news and get to the real issues.